The 9th letter of the alphabet is I the 11th is K. The pentagon had 5 sides. The 5th letter is E. IKE. It happened in 2001. get rid of the noughts we have 21. Two and one make 3 the 3rd letter is C.
Building 7 was known as the Salomon building. Solomon? The seal of Solomon was also known as the star of DAVID. I realised this and looked out my window. There was a truck going by with the word rockSTAR on it. Icke predicted 9/11. I think the Illuminati are making a sick joke or somekind of evil spell. We are all familiar with the idea that the film BACK TO THE FUTURE predicts 9/11. 2996 people died during the attack. If you translate that into numbers you get BIIF. Very much like BIFF, the villain in Back to the future. strike (someone) roughly or sharply with the fist. "he biffed me on the nose"
If you add 2 and 9 you get 11 which is K.
Which is short for knock out. The creator of the time machine in BTTF was Emmet Brown. The Jewish word EMET means truth. I wonder if the Biff part relates to Hiram Abiff, the freemasonic figure who was murdered because he would not divulge masonic secrets. According to WIKI Biff Tannen lives on MASON street. "They had as king over them the angel of the Abyss, whose name in Hebrew is Abaddon and in Greek is Apollyon (that is, Destroyer)." 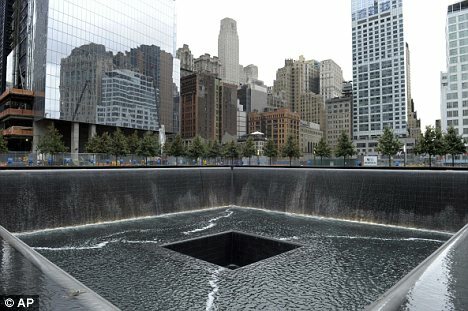 The 9/11 monument is a pit, or abyss? Emmet is Cornish for ant - it's used as a name for tourists. "The traffic was awful - too many emmets on the road!" And the design of the Cornish tartan is younger than I am! So, there was an Ant Dalton ?? ?